By Jeff Aranow: Gennady “GGG” Golovkin’s trainer Abel Sanchez is concerned with him ending up on the losing end of a controversial decision if they allow the highly popular Saul “Canelo” Alvarez (49-1-1, 34 KOs) go the full 12 round distance in their fight on September 16 at the T-Mobile Arena in Las Vegas, Nevada. Canelo previously has won very questionable 12 round decisions over Erislandy Lara and Austin Trout that arguably should have been defeats for the redheaded Mexican star. In Canelo’s fight against Floyd Mayweather Jr. in 2013, one judge scored the fight a draw. Those fights highlight how difficult it is to beat Canelo by a decision. Canelo will likely have the boxing fans on his side at the T-Mobile on September 16. That means every punch that Canelo lands, the crowd will roar with approval, causing an echo effect that could lead to the judges giving him rounds that otherwise might go Golovkin’s way. Sanchez says it’s their fault if they allow Canelo to see the final bell in round 12, because they don’t want to end up losing a controversial decision as well. Golovkin doesn’t fight in Las Vegas a lot like Canelo does. Canelo’s promoters at Golden Boy Promotions put on a lot of cards in Vegas. Canelo is a big name over there, and he brings the boxing fans into the city to see him fight. 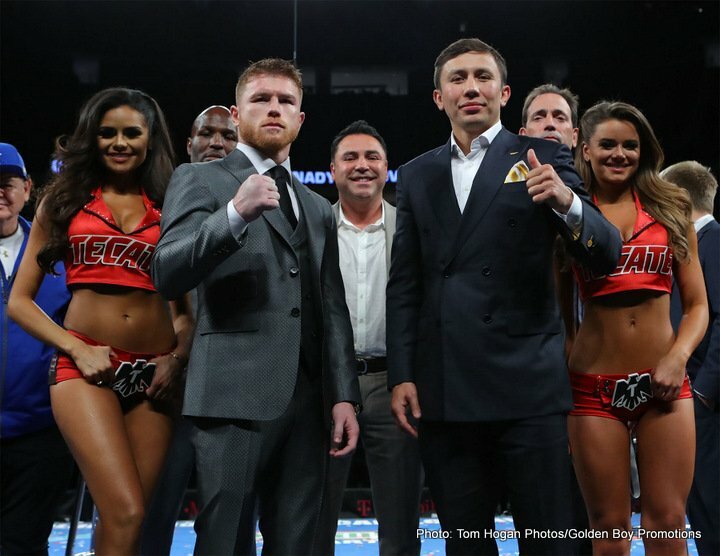 Golovkin should be cognizant of what a popular fighter like Canelo means to Las Vegas. Although Canelo is from Mexico, Las Vegas is for all intents and purposes his home this fight. Canelo is the A-side. Golovkin is the visitor, and it’s rarely a good thing to be the visiting fighter when it comes to winning decisions. Golovkin (37-0, 33 KOs) will need to put himself in harm’s way for him to knockout Canelo. Triple G is not going to knockout the 27-year-old Mexican star by using his power jab for the entire fight like he did in his last match against Daniel Jacobs on March 18. That fight went the full distance, mainly because Golovkin was relying on his jab and not throwing enough power shots in the fight. If Golovkin does stand in front of Canelo and unload on him, then he’ll need to withstand Canelo’s best head and body shots. Golovkin can knock Canelo out if he can take his punch and force him to brawl for 3 minutes of every round, Canelo is not the type of fighter that fights 3 minutes of every round. He’s more the type that fights hard for half the round, and then other half he’s resting on the ropes. Canelo fights hard for 15-20 seconds for s short burst of activity, and then he rests for 20 to 30 seconds. When Canelo has finished resting for a brief period of time, he’ll attack for 15-20 seconds again and then rest once more. That’s how Canelo fights all the time. Where Canelo is vulnerable against Golovkin is if he’s forced to fight all out for the entire round without getting his rest break. Canelo won’t last long if Golovkin forces him to fight the full three minutes of each round for a full 12 round fight in my opinion. Canelo gets too tired, and he must go to the ropes to restore his energy. Canelo can keep his opponents from taking advantage of him when he’s against the ropes by throwing left hooks and uppercuts. Even when Canelo’s tired, his hands are still fast and he still can punch well. He’s not a huge puncher, but he has enough pop in his shots to get you out of there. Golovkin need to worry about Canelo’s uppercut, as that’s the shot that can hurt him. Golovkin has already shown to be vulnerable to the uppercut in his fight against Kell Brook last year. Canelo will have studied that fight and he’ll use using uppercuts repeatedly in hopes of connecting with it on the chin of Golovkin. It’s easier said than done in trying to knockout someone like Canelo. He seems to absorb power shots without any problem when they’re thrown at his head. Canelo makes it even tougher to hit him cleanly because he uses a lot of head and upper body movement, which causes his opponents to decrease the power on their shots to try and improve their accuracy at hitting him. The one area where Canelo has shown to be vulnerable is to the body. He’s short and built like a box, and it’s impossible for him to avoid body shots. Canelo doesn’t move well enough to get out of the way of punches to the body. But what makes Canelo’s opponents reluctant to target his body is his counter punching ability. Canelo tends to make his opponents pay when they throw body shots. Former WBO junior middleweight champion Liam Smith is one of the few fighters that went after Canelo’s body and had success when he was against the ropes. Smith quickly got tired of the fast pace that he set in their fight last year, and he ended up getting knocked out in the 9th round. Smith had talked about wanting to wear Canelo down with a fast pace. Smith was doing an excellent job of accomplishing that goal through the first 4 rounds of the fight. However, he got tired by the 5th round, and Canelo took over the fight and dominated. Smith had worst stamina than Canelo. To beat Canelo at a fast pace fight, you need to be the type of fighter that can push that kind of pace without gassing. Liam Smith obviously was not that type of fighter. “Canelo has to dominate Golovkin and get him out of his fight. If he can do this, then he has a chance,” Sanchez said. –	Flashy combination punching in short bursts. Canelo’s flashy combination punches help him win rounds, even though many of the shots aren’t landing. Just being seen throwing fast combinations makes Canelo look good. It not just him though. A lot of fighters do that. Canelo’s promoter Oscar De La Hoya beat Felix Sturm by a controversial decision many years ago. De La Hoya was throwing speedy combinations that were being blocked, but the judges were impressed enough to give him the win. Sturm was landing the better shots all night long. Canelo is a bad style match-up for Golovkin. He’s not fought anyone with the combination of hand speed, size and power that Canelo has going for him. Canelo probably isn’t as fast as Kell Brook, but he’s got more power, size and he’s more willing to go on the attack and throw sustained combinations. I don’t know if Canelo will do that with Golovkin though. Canelo might think twice about going on a sustained attack against Golovkin if he fears getting hit with something. In the back of Canelo’s mind, he needs to also worry about throwing too many shots that force him to take a rest break against the ropes. His trainers will have told him to don’t overdo it by throwing too many punches, and they’ll make sure he stays off the ropes. Canelo will have to be in great shape for him to stay in the center of the ring without needing to rest. Personally, I don’t think Canelo can stay off the ropes. He’ll back up against the ropes, hoping to rest and set a trap for Golovkin at the same time the way that he set traps for James Kirkland and Liam Smith. Those were not good fighters, and they didn’t have the conditioning to trouble Canelo. One thing that could be a problem for Canelo is all the work he’s been putting in for his training camp. He’s working hard for the Golovkin fight, focusing on his stamina and boxing. Canelo might overdo it, and come into the fight depleted. You won’t see it right away with Canelo, but he could start to wear down by the 4th round if Golovkin forces him to fight hard. –	Size – GGG will have close to a 3-inch height and reach advantage over the 5’8” Canelo. The size only helps Golovkin if he keeps Canelo from landing his shots the way that Erislandy Lara and Floyd Mayweather Jr. both did. But as we saw in the Lara fight, it doesn’t matter if you’re getting the better of Canelo and not getting hit. You can still lose the fight if it goes the distance. Canelo only hit Lara 31 times to the head, and he still won the fight. Golovkin won’t be able to count on winning if he stays on the outside and uses his jab the way he did against David Lemieux and Danny Jaocbs. If Golovkin gets stuck just jabbing Canelo for 12 rounds, he could find out the hard way that you don’t beat a guy like Canelo by a decision. Golovkin can do things against Canelo that he couldn’t do against the 5’11” Jacobs. Golovkin can jab Canelo if he wants to without worrying about getting hit. Canelo will have practiced at step forward quickly to get in punching range when Golovkin jabs. That could work for Canelo or against him. It depends on how quick Golovkin is at recognizing Canelo tactics and landing a right hand when he charges.